I love bagels. There’s nothing better than a nice smear on an everything bagel. I really miss the fresh-baked bagels I got in my neighborhood when I lived in Brooklyn. There was a place that sold bagels wholesale, and you could smell the cinnamon raisin ones baking from blocks away. It felt like you were doing something a little underhanded when you went through the back door into the huge room of ovens, men and cooling racks. Someone would eventually notice, and tell you what they were baking that night. It was a cash only endeavor, making it seem elicit. As much as I romanticize about those bagels, I’m in North Carolina now. It’s not the bagel capital of the world, but the bagels are pretty decent here if you go to the right places. Hint: the right place is not the grocery store. I’ve found a bakery that makes a whole wheat everything bagel – which, in my opinion, is the perfect combo. I’ve solved my problem of getting bagels, but there is another issue. Now that I don’t eat dairy I’ve found that I’m not very fond of most of the store-bought vegan cream cheeses. I created a homemade version using a perfectly ripe avocado I had on the counter. 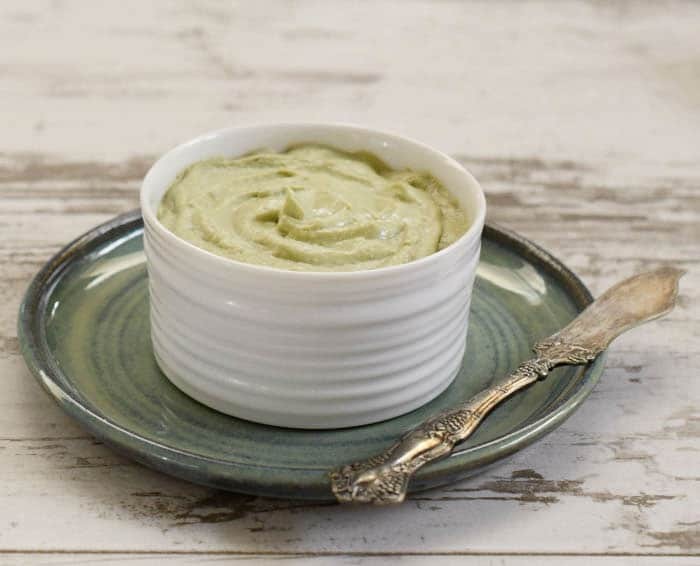 Avocados are nature’s butter and makes your homemade vegan cream cheese more luxurious. I created my favorite garlic herb combination, but you make your favorite flavor by mixing in what you like. Be sure to try walnut agave, chopped olives or blended strawberry. 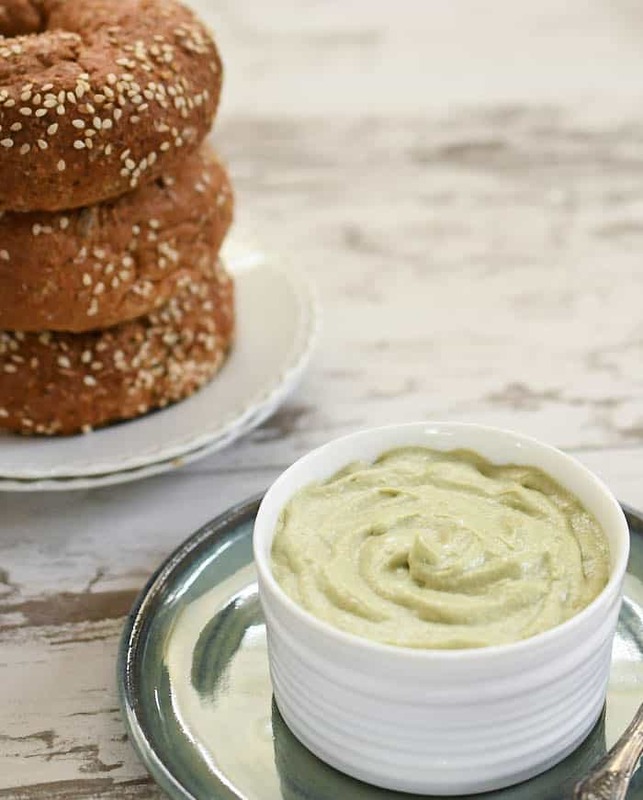 Finally something worthy of your bagel! It will dress up a veggie sandwich too. The variations are endless. Leave out the herbs and garlic, try minced carrots and celery, minced olives, or even throw in some walnut and agave. Soak the cashew in the water overnight or at least 2 hours. Drain off any left over water that was not absorbed by the cashews. Add the drained cashews, avocado, lemon juice, Italian seasonings and garlic into a blender. Blend until smooth, stop and scrape down the sides and repeat until the mixture is smooth. « 19 Vegan Tacos Everyone Will Love! Would love to know the fat content of this. You can get the nutritional information by plugging it into a website like Sparkpeople.com. If you are looking for a low-fat food you might want to skip this one. However if you are just looking for a no-oil added recipe that naturally has fat then this may fit into your diet. Genius stuff…this will make the avocado lovers in my family very happy! Wow, I’m really dreaming of a bagel right now. NC is at least better than switzerland in the bagel category! The best I’ve had are the ones I made at home. I don’t eat dairy either as of late, so this will be a great topping in place of cream cheese! This looks great, and I can’t wait to try it! How long would this keep in the fridge? It should keep for at least a week. The top may brown a little, but you can scrape that off. I like your recipes and would like to print these recipes, so I can use them right away in my kitchen but please WITH the photo of the recipe? Kathy, this looks amazing! By chance did you blend the ingredients using a Vitamix? Just want to be sure the small amount of ingredients would blend well in mine. Thank you! This looks great! I’m going to try it today but with almonds because that is all I have on hand. I don’t think any recipe that involves avocado could possibly go wrong though!! About a cup and a half depending on the size of your avocado. I followed recipe exactly, soaked cashews overnight. I thought the lemon over-powered all the other flavors and I love lemon, but next time, I’ll add lemon in smaller amounts. Might sprinkle some chopped cashews on top to bring in more cashew flavor. What is the purpose of so much lemon? 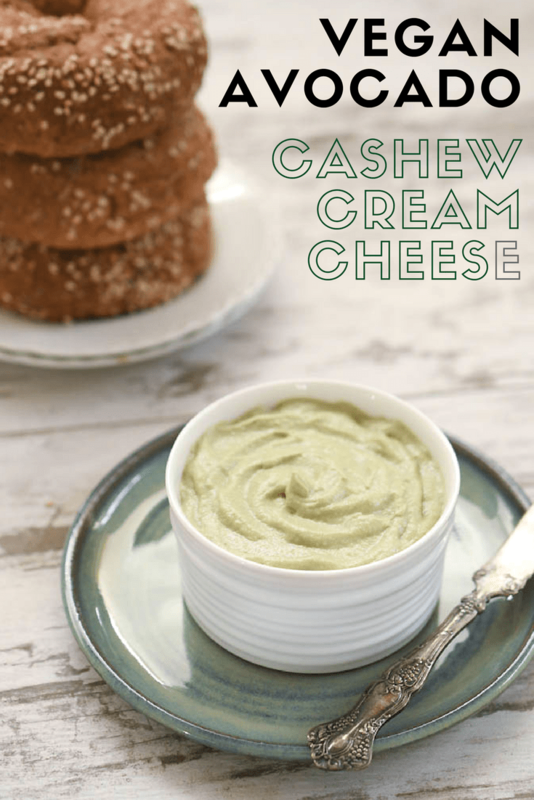 Every cashew cheese I’ve tried have had an overpowering lemon flavor. I’m wondering if I can omit it or decrease it greatly? It’s to add to the sour flavor and keep the avocado from turning black. You are welcome to reduce it to suit your taste or use a little apple cider vinegar in it’s place. I had to halve the amount of water in this. I used about half a cup of water and it’s still very thin. 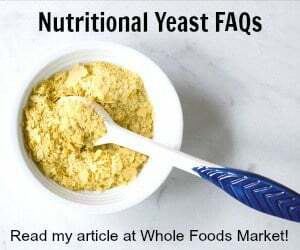 I agree that the lemon flavor is pretty heavy, butI added some nutritional yeast and I think the flavor balanced out pretty nicely. The water is only for soaking the cashews and is then discarded. 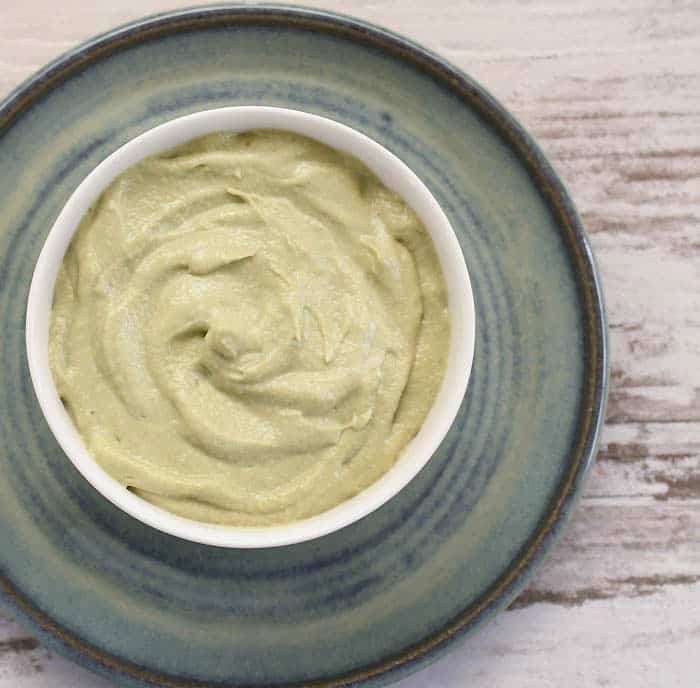 Does this dip change colour because of avocado? How long does it keep fresh in refrigerator? Not if you use the full amount of lemon juice that’s called for. I’d say it keeps about 5 to 7 days. Do u have recipes for the other cream cheeses, or are u simply adding in the items i.e. strawberries etc…?? You are just mixing in other ingredients in place of the ones in the recipe to create different flavors.